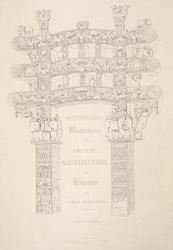 This is the frontispiece to James Fergusson's 'Ancient Architecture in Hindoostan'. It shows a torana (gateway) to the Buddhist site of Sanchi in central India. It is not Fergusson's own work - he had not been to Sanchi at this point; rather it is an anonymous drawing he found in a scrapbook presented to a Colonel Grace by the Royal Asiatic Society. The Buddhist toranas of India influenced gateway forms in China and Japan. Sanchi was a centre of Buddhism from the third century BC: the construction of these buildings was begun then under the Mauryas. Four beautifully carved gateways were added to Sanchi's great stupa in the first century BC. Engravings and sculptures illustrate Buddhist myths and beliefs. The gateways featured square posts crowned with groups of elephants, lions or squat mannikins supporting architraves with scrolled ends, and graceful bracket-figures of voluptuous yakshis (nymphs).